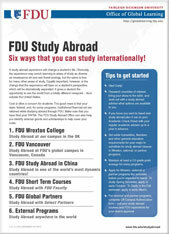 To apply for full semester or short-term study abroad, visit FDU Study Abroad. Requirements vary based on program. There may be additional obligations. All participants are required to carry the University sponsored health insurance plan for the duration of their travel. Please refer to Health Insurance Fact Sheet for Enrollment instruction. This form must be approved by your department chair, dean and provost before being forwarded to the Study Abroad Office. To be completed by authorized Study Abroad Staff in Consultation with Faculty Leader.